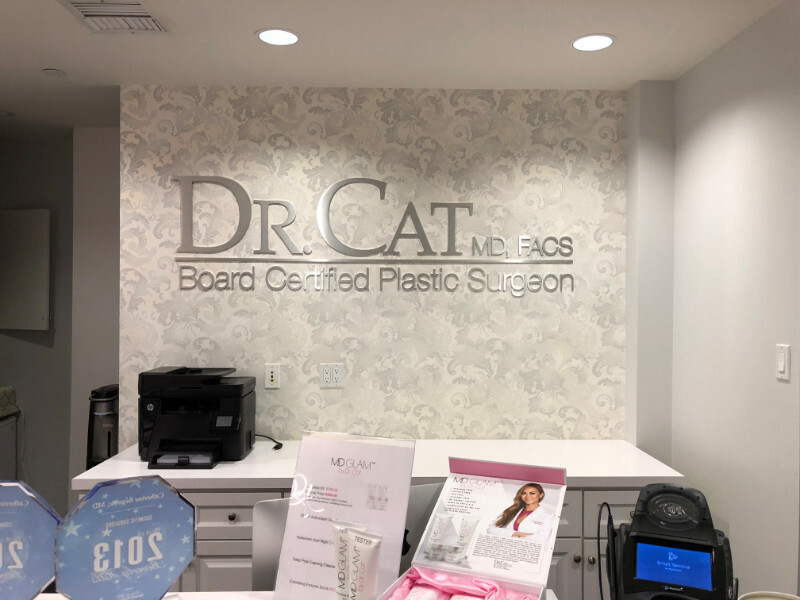 Located in Suite 330 of 9735 Wilshire Boulevard, Dr. Cat Begovic is a renowned Beverly Hills plastic surgeon. She emphasizes excellence in her practice and patient care. 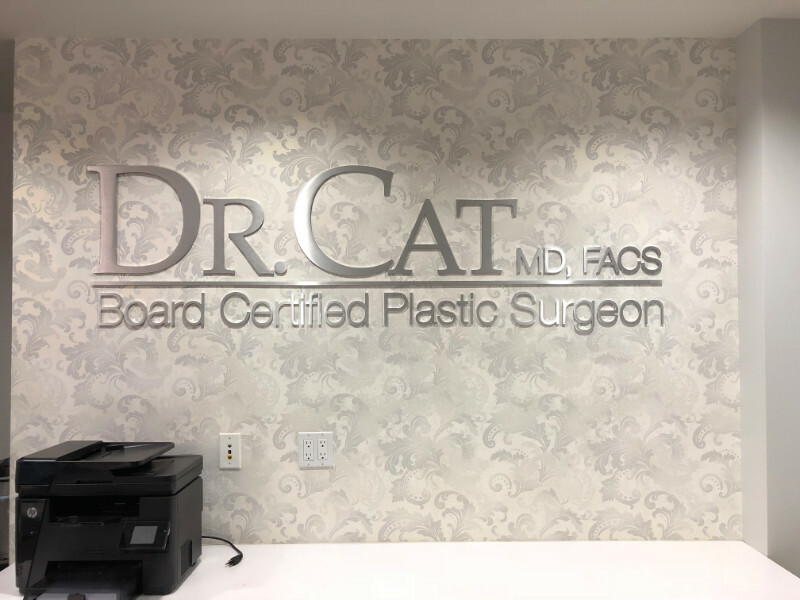 When Dr. Cat needed reception area signage that would encapsulate her brand message, she contacted our shop to discuss the design of an aluminum lobby sign in Beverly Hills, CA. Brushed aluminum adds a professional touch! After meeting with our client, we reviewed the business’ font and letter sizing specs. Next, we designed a quarter-inch-thick brushed aluminum lobby sign. Our technicians slightly modified the design to allow for stud mounts. The metal catches the eye and combines elegance with pizzazz. Its matte finish looks great with the light-gray wallpaper that features tasteful ornamentation. We centered the lettering on the allocated wall space, where it fits right in with the rest of the interior décor. Which Reception Area Sign Could be Right for Your Business? Metal is the most impressive material for a lobby sign bar none. It expresses excellence in a niche, the longevity of the company, and the intent to remain in place for a long time. A broad range of finishes and materials ensures that your firm gets the lobby sign that best expresses what your business is all about. But there are other options as well. 3D Lettering allows you to show off credentials! Metal laminate. When solid metal gives you sticker shock, consider the installation of a metal laminate sign. We typically apply the material to sign foam, which is inexpensive, durable, and good looking. It is a common alternative to metal signs. Foam. That said, you could just stick with foam. Foam letters are an economical solution for almost all of your signage needs. In the lobby, they can add an impressive three-dimensional look by measuring up to three inches in depth. Our technicians paint them in your brand colors or add imprinted vinyl overlays for gradient color changes. Acrylic. Another excellent material for a lobby sign is acrylic. Flat-cut letters can look glossy or matte, depending on your preference. The product itself is transparent, but we paint it in your desired tones. If you like to combine lighting with your style elements, acrylic is an excellent choice. Our technicians can add LEDs behind the material for a halo-lit presentation of your lobby sign. Ready to get started on a custom lobby sign? It is tempting to skimp and save money on your interior signage. But the lobby sign is not the marker that you want to neglect. It contributes to that excellent first impression, which can make the difference between gaining a new client and losing one. Consumers expect businesses to present with this product. When it is missing, they notice. When it is old, tired, or cheap-looking, they also notice. Because there are now so many budget-friendly materials on the market, this product is affordable for any business. Whether you are just starting out or have been established in your niche for decades, the right lobby marker makes a difference in the way consumers interact with your brand. 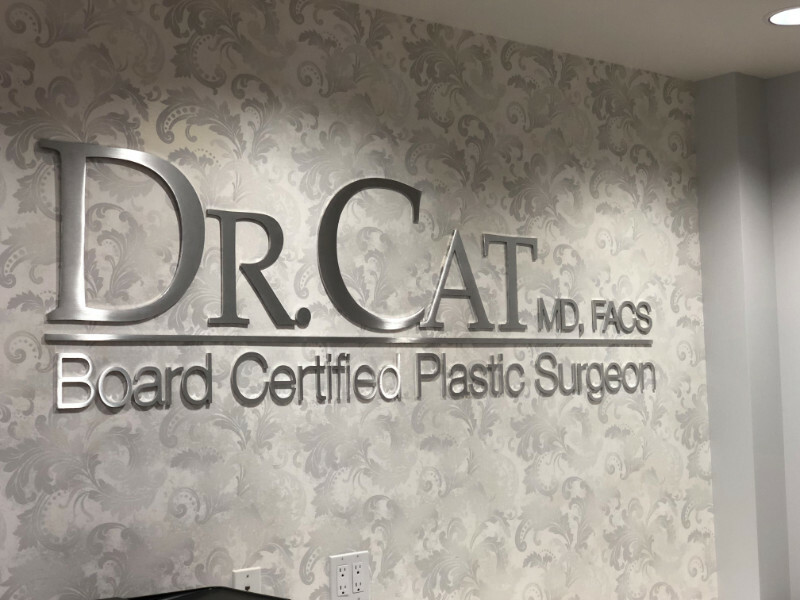 When you want an acrylic, foam, metal laminate, or aluminum lobby sign in Beverly Hills, CA, or elsewhere in the Southland, we can help. Contact us today to get started on your project!